Confession: I might have saved the nylon visitor’s pass from my recent visit to Meyer Sound. The place is like Disney World for audio geeks; who could blame me? In fact, I was so immersed in the experience of various sound system demos and an extensive factory tour that I hardly took any notes to help me write this blog. It’s like flying without a parachute, but here goes. 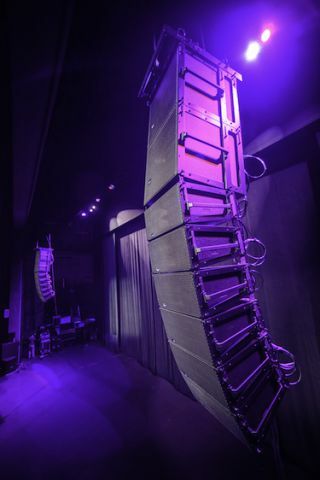 LEOPARD, the little cousin of the acclaimed LEO line array was designed for medium-sized venues of about 1,200 seats, opening the product line up to a much wider base of applications. My visit kicked off with director of product management Luke Jenks rehashing a scene from Meyer’s annual, company-wide meeting. Employees worldwide gather at the Berkeley, CA headquarters to meet and listen to the latest products. Last minute, John Meyer challenged Luke and his team to set up the flagship new product, LEOPARD, in the company parking lot for an outdoor listening experience. So while most of the company was outside enjoying some champagne, the product management crew was scurrying to hang the system in front of them all. There was no time for tuning, testing, or presets—luckily LEOPARD is optimized for native mode operation with default low-mid array compensation for simple array setup, allowing it to be up and running in as little as 10 minutes. Long story short, the demo was a big success. Luke recalled being impressed with how compelling it sounded with such short setup time. LEOPARD, the little cousin of the acclaimed LEO line array, was designed for medium-sized venues of about 1,200 seats, opening the product line up to a much wider base of applications. A scaled down system was demo’d for me in Meyer’s own Pearson Theatre, an intimate space of just 57 seats. As Luke and product management system solutions specialist Matt Ferguson ran through a variety of demo cuts for me, starting off smooth and jazzy, I strolled around the theater searching in vain for any type of dropout. Even standing directly underneath the arrays, there was almost no variation in the soundfield. Luke and Matt even humored my oft-ignored request to flex the muscle of the system, cranking it up for a bass thumping EDM track called “Centipede.” It had me giggling like a giddy fool. Credit of course goes to the world-class engineering team headed up by Pablo Espinosa, VP of R&D. The product management team that Luke heads serves as the bridge between customers and engineering, communicating the needs and challenges on the ground to engineers; they also drive product strategy after a product is built. In the design process, R&D tested a range of voice coils, magnetic assemblies, baskets, and other components in search of the perfect solution. “We can’t give enough kudos to the engineering team behind LEOPARD and the amazing creativity and hard work they brought to the design of every component, from the electronics, signal processing, mechanics, and rigging to the amazing horn and what we all agree to be a beast of a low-frequency driver,” Espinosa stated in a recent Q&A. A scaled down LEOPARD system was demo’d in Meyer’s own Pearson Theatre, an intimate space of just 57 seats. LEOPARD is the main attraction for Meyer Sound at InfoComm next month. There will be two venues for demos, the scaled down configuration in the show floor demo room, and then the full system demo’d in the Valencia Ballroom. A lot of credit also goes to Meyer’s meticulous in-house manufacturing processes, which I witnessed following the demos. The entire corporate campus, spread out across a half dozen buildings now, is shockingly low profile from the outside. This is a company that prioritizes the fancy parts in their speaker enclosures—where you can hear the difference—and not so much in its humble appearance. The precise composition of the paper used in Meyer’s cones was something no OEM could meet consistently. Watching the care and scrupulous testing and notation the employees clearly took pride in struck me as exceedingly rare. Assembly of the driver components was so well structured and documented that I felt like I could have walked in the door and put one together myself. The accountability in the system is admirable. There wasn’t a traditional assembly line type process; a single person is responsible for building each unit. The components are individually tested repeatedly before being compared to reference speakers, a supply of which dates back to every model ever produced by Meyer, which made for another geek inducing bout of giddiness on the part of yours truly. You can read more of the inside story at Meyer Sound R&D from Pablo Espinosa in this Q&A. And allow me to recommend that you take the time to get the full on LEOPARD demo at the Valencia Ballroom during InfoComm 2015.